Felipe Massa became the sport's 87th different winner when he won the Turkish Grand Prix, but in doing so he also damaged his team-mate Michael Schumacher's title challenge. To be fair, Vitantonio Liuzzi had a hand in that, too. When his differential seized and the safety car was needed, it changed the complexion of the race. Massa led away from pole with Fernando Alonso second and Schumacher third heading to turn one. Alonso was squeezed by the two Ferraris and had to back out of his move which caused the following Giancarlo Fisichella to brake and all hell broke loose behind him. On lap 13 though, Liuzzi was stranded in a vulnerable position and the safety car made an appearance. With Massa diving for the pits, Ferrari couldn't afford to keep Schumacher out for another lap and so he had to pit behind Massa - and wait his turn as the Ferrari mechanics processed one car and then attended to the German's. 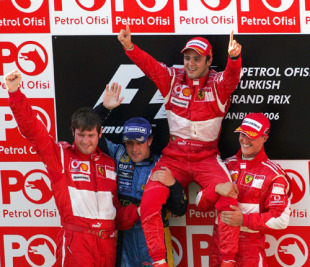 That put Alonso ahead of Schumacher but he was no match for Massa who revelled in the Turkish circuit. Instead, Alonso was attacked by Schumacher for second place but he stood his ground and kept Schumacher behind him. "I was lucky with the safety car," said Alonso. "I overtook Michael and then Michael made a small mistake and ran wide and I was light on fuel in the second stint so that helped me to keep the place." After his first win and first pole, Massa was ecstatic. "It's just fantastic," he said. "To have been working so hard for your whole career and then achieve this is an amazing feeling. 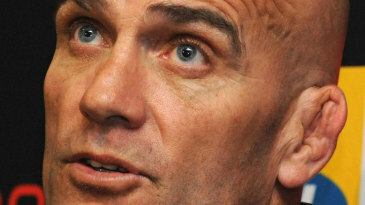 It's been a fantastic day for me."